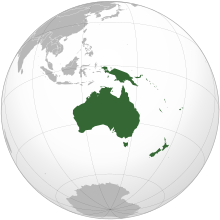 Oceania is a geographical, often geopolitical, region consisting of numerous lands—mostly islands and usually including Australia—in the Pacific Ocean and vicinity. The exact scope of Oceania is defined variously, with interpretations normally including Australia, New Zealand, New Guinea, and various islands of the Malay Archipelago. The term is also used by many authors and in many languages to define one of the continents. Français L’Océanie est en géopolitique une région regroupant des territoires situés dans l'océan Pacifique. Incluant l'Australie, la Nouvelle-Zélande, la Papouasie-Nouvelle-Guinée, la Tasmanie et bien d'autres îles et archipels, l'Océanie est le plus petit des continents. More images Oceania - Oceania (Category). Map of the countries of Oceania in Macedonian. This section holds a short summary of the history of the area of present-day Oceania, illustrated with maps, including historical maps of former countries and empires that included present-day Oceania. Map of the members of the Pacific Islands Forum in Macedonian.